The last actual Bond game, called Nightfire, was a solid foray into an already overloaded genre that Sir James Bond helped revolutionize in the form of Rare?s N64 classic, GoldenEye 007. It was the last original story that would actually work, save for this game, which plays out just like a movie. The next game in the Bond universe stripped the third-person elements away, relying solely on basic first person shooting that tried very hard to imitate Halo. The game?s main selling point was the idea that you could be a villain?a nondescript, generic villain with no face or voice, but a villain nonetheless. What?s really sad is that all Bond villains are really cool and devious: Alec Trevelyan, the baddie from GoldenEye; Auric Goldfinger, the man with the Midas Touch; Jaws, a hulking brute with teeth made of steel; and more than thirty years? worth of other villains. It was a rich history, and a legacy that could have made for ingenious gaming. However, the execution fell flat because of the lack of heart, as it has in many recent EA games, such as Need For Speed Underground 2 (which was a great game, but was trying too hard), and Marvel Nemesis (which also had a great license, but failed to deliver on many fronts? mostly depth). Yet Everything or Nothing, the game that preceded Rogue Agent, was a great title. It was a game that had few flaws, and was the ultimate Bond experience to date. With intense shootouts, fast car and motorcycle chases, great animation and graphics, as well as a heaping of excellent storytelling, Everything or Nothing throws the player in the shoes of James Bond with great results. James Bond is responsible for some of my favorite action games in recent years. And while I did enjoy his exploits on the N64, with The World Is Not Enough being one of my all-time favorite multiplayer games, I found that the pacing and execution of this game to be near perfect, much moreso than any of the shooter games. With the first current-gen Bond game, Agent Under Fire, EA introduced a brand new element called Bond Moments. 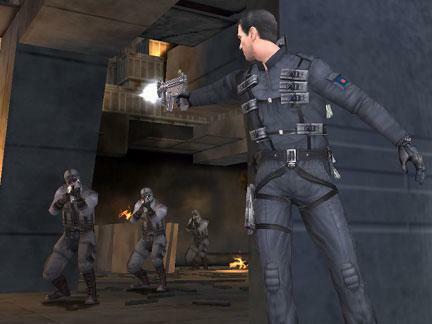 Essentially (if you have never played a current Bond game), Bond Moments reward the player with points if they perform an action that Bond might. For example, jumping over rubble on a makeshift ramp, or turning on steam vents so that soldiers can?t see you. Some are quite obvious, and others are well hidden, designed to make the player explore the levels, or buy a strategy guide. EA brings this back in fine form here, with perhaps more Moments than ever?sliding under a tanker on your motorcycle during a highway chase, for example. Being a third-person game, EA had to incorporate elements of other third-person games, while avoiding the awful mistakes of the PS1 bomb Tomorrow Never Dies (the very first third-person Bond game). They took basic stealth elements from Splinter Cell, racing mechanics from the Need For Speed series, and the intense shooting action of Dead to Rights while innovating in their own right. Manual aim for the player, and something called Bond Sense, which slows down time, much like in Enter the Matrix, so that players can select inventory without pausing the game, or getting injured. Well, that works for the most part. It?s a little clunky, and a little odd, but the ideas are right?all it needs is a little polishing. Not bad for such a well polished game. All of the right elements for a triple-A shooter are there, and EA delivers marvelously. On the same note, the other major game play mechanic is the vehicle segments. With cars ranging from the Porsche 911 Turbo to the Triumph Daytona 500 motorcycle, to a helicopter, all of the elements of fast paced chases are there. One of the first you?ll encounter is against a quickly moving train, which you have to get under before it gets on a bridge that you will fly off of. All the while, terrorists are shooting at you from motorcycles, SUVs, helicopters, and the train itself. The game is incredibly quick at these points, and only breaks away from spectacular explosions and collisions. It?s really very well done, and a joy to play. The one problem I have with the game is the co-op element. Supposedly existing parallel to the main game, co-op urges you to complete short segments of one level until you get to a boss. But the game here is so unbalanced that it just gets frustrating. I have a friend that doesn?t get mad easily who got enraged at the difficulty of this game. The worst part is that in order to unlock multiplayer deathmatch, you?ve got to beat the first level of co-op, which is nigh impossible. Overall, however, the game is well done, and well balanced. It does get remarkably tough in some spots, but the sheer ingenuity of the game itself, and the atmosphere the game generates, are such that to stop playing is a mistake. The graphics here are so well done, so well produced, and so well animated, that it is near unbelievable that they were developed using tools from a year ago. Much of the game looks like the games that are supposed to push the system?s limits, rivaling such games as Metroid Prime 2, Halo 2, and even Splinter Cell: Chaos Theory on the Xbox. EA digitally scanned all of the actor?s faces, including Pierce Brosnan, Willem Dafoe, and Judi Dench, and then just animated them in a completely believeable and lifelike fashion. In addition to that, the character models are smooth and polished. Interaction and collision detection are impeccable. Punch Jaws in the face, and watch little details, like Bond shaking the pain off his hand and grimacing in pain. Flourishes like this are rife in this adventure. It all adds to the uniquely cinematic experience that is presented in the game. When you boot the game up, after an introduction level, you are forced to sit through R&B singer Mya?s rendition of the game?s theme, Everything or Nothing. It?s pretty bad. But after the excruciating pain of that unskippable introductory sequence, all of the familiar Bond sounds are there. Like the James Bond Theme. And all the gunshots, explosions, and yells that James Bond is associated with. In addition to this, all of the actors that modeled for the game, like the aforementioned Pierce Brosnan, Willem Dafoe, and Judi Dench, plus model Heidi Klum, singer Mya, and actor/model Shannon Elizabeth, plus John Cleese as Q, all appear, and, for the most part, give good performances. Some of it is melodramatic, and that?s to be expected. Brosnan, Dafoe, Dench, and Cleese all give the best voice work, which is realistic since they are all actors. Overall, the star-studded cast only adds to the cinematic value of this game. There were absolutely no bugs, exploits, or glitches that I experienced while playing this game. This only serves as a testament to Everything or Nothing?s polished game experience. While the controls take a minute to get used to, they are extremely intuitive, and become second nature within the first five minutes of the game. The great thing about the controls is that, while you do drive many different vehicles, the control systems are essentially the same for all of the vehicles in the game, with minor differences, like the controlling of elevation in the helicopter, or the ability to perform a wheelie or stoppie on the motorcycles. In terms of interface, Everything or Nothing couldn?t become more refined. Everything is accessed through the main menu, which has probably four options. And it?s all incredibly intuitive. Cloud is Final Fantasy VII's iconic hero, known for his huge sword and being a man of few words. Vincent Valentine played a minor role in Final Fantasy VII, but that's about to change in Dirge of Cerebus. In this game we learn about Vincent's past and how he must save the world from Shinra once again. There wasn't a whole lot of room for exploration as many paths were conveniently obstructed by debris or locked doors. Many paths are temporarily blocked by electronic gates that become unlocked after you find its key card. Sometimes the key cards are just accross the map, but they are usually dropped by a tougher than normal enemy. Jukeboxes can be found in almost every level and they serve as storefronts. I don't think they play music though. Since I emulated this game on my PC, my audio experience is a bit marred by the stuttering in the cut scenes. The voice acting was good and I did enjoy the final boss music even though it was in Japanese. Cid has his usual quirks like smoking and cussing up a storm. Of course, violence is a given and Vincent Valentine makes revolvers look cool. Lastly, like many games these days, the females have less clothing than their male counterparts. If you don't mind those issues or average gameplay, Dirge of Cerebus does have a good story to tell. You just have to be patient to get through it all. My love affair with EDF started when the previous publisher of the series, XSEED Games, sent us both the PS4 and Vita versions to review back-to-back. (To be fair, had I known these games existed earlier, I probably would have squeed then, too.) Once I started playing them, I quickly realized that these were just what I was missing in my life: any reason at all to shoot lots of powerful weapons at lots and lots of giant insects without any regard for the collateral damage. Neat! If this sounds like a bad B-movie, that is quite intentional. As a matter of fact, the voice actors are likely told to do just that - overact and make it sound as ridiculous as possible. And they do a wonderful job doing just that, which adds so much to the charm of this game. I am so glad a humorous cheese-fest crosses cultural boundaries as well as it does. My experience with this series only goes as far as those two other entries (and the PC version of 4.1). So I can't speak to the much older ones, or the PS3/Xbox 360 releases in the past. But what I can say is that EDF 5 is a solid evolution of the series, but also just that - an evolution. If you have played recent previous entries, you pretty much know what to expect. If not, then you could easily read my EDF 4.1 review (here!) and, after reading it, virtually everything that review says about that game also applies here. I'm not sure I'd call that a bad thing, as the previous games are great, but it's something to be aware of. If you are sick of EDF 4.1, or if you didn't enjoy those, then this game is not different enough to change your mind. With all of that said, what is Earth Defense Force? Well, it's a third-person shooter where you (and potentially, up to one other buddy locally, or three others online) work to save the human race from alien invasion. The invaders take many different forms, including giant insects, toads (new! ), flying saucers, and who knows what else, while you blow them to smithereens. You get to do this as one of four different classes: the Ranger, Wing Diver, Air Raider, and Fencer, each with their own strengths and weaknesses. The Ranger is your standard soldier who carries a couple of different, high-powered weapons with him. He shoots, things go boom. One change new to this game is support equipment. Rangers have one slot for this. These include things like improved stats via armor, or vehicles like tanks, helicopters, or bikes. Wing Divers are your female characters, and they specialize in mobility. They have always been my favorite, because I don't care what you look like if you can fly. Their weapons and flight/movement are all reliant upon energy. Once that drains, you are more or less a sitting duck. New to this game are upgradeable plasma cores, which can allow you to have a larger pool, recharge more quickly, fly faster, and likely quite a bit more that I haven't discovered yet. Air Raiders are the support class in EDF. They can be incredibly powerful, but they have very few (if any) direct-fire weapons. But, they can call in air strikes. What more needs to be said? They can also heal, bring in vehicles, and quite a bit more. I am not a very good Air Raider (I need my pew pew), but a good one can be a fantastic asset to any team. Fencers are a unique class, in that they have more weapon slots than any other class, but are also strange to maneuver. They are actually a heavily-armored soldier, wearing what is essentially power armor. They can be really cool, but take a bit more practice and skill than your everyday Ranger. Recommended for advanced players. They also have support equipment, which is new to EDF 5. Other than just the various classes, wacky enemies, and frantic action, the other main draw to keep you coming back is the many varied drops, especially weapons. Armor drops increase your max hit points; it goes up based on how many you pick up on each level. Weapon drops, however, are the real hook. Depending on your map and difficulty level, drops can vary in power significantly. There are tons of different weapon types, as well as levels for the weapons themselves. Each class also has to be powered up individually. So, if you make a very powerful Ranger class, but want to level up an Air Raider, be prepared to go back to much earlier levels to do so until you are buffed up on both weapons and armor to be able to handle later levels. Thankfully, one of the mitigating factors to this, which is new in EDF 5, is that armor drops are shared now, and a small number of weapons will always go to a class other than the one you are using. While most still go your primary active class at that moment, now, when you want to try a new class, you are not completely starting from scratch. This is more than a small tweak to EDF 4.1's formula. Another significant quality-of-life improvement is that they made most classes faster with dashes or runs, and pickups can be grabbed from a larger radius. Typically, the Wing Divers always grab everything, which is fine, but now, every class is much more useful in collecting loot. Another huge annoyance from before was that if you lost the level, no matter how far along you were, you got nothing from all of your efforts. No armor, new weapons, or any of it. Now, in EDF 5, you get to keep a fraction of what you earned before death. It's great, because you don't feel like you wasted your time any longer. Technically, the game runs pretty well on PS4 Pro, but I was surprised to see that it clearly is not running at a 4k resolution. It may be 1080p, or something in between, but it's not 4k. Nevertheless, the frame rates are great, which is far more important in a game like this. I will say, though, that I have been absolutely spoiled by the PC version of EDF 4.1. That port is fantastic, and runs and looks so great in action, with a perfect frame rate at 4k (with a powerful enough PC) that I wait with bated breath for an announcement of EDF 5 for PC. Let's hope it happens. During your time blowing things up, you often hear voices and announcements over the intercom, which are sometimes quite humorous. You also occasionally may hear the Infantry units shouting "EDF! EDF! EDF!" The voices will sometimes say other things less appropriate, including words like 'd*mn', 'h*ll', and 'sh*t'. This, along with the music and sound effects, keeps tensions high as you try to wipe out the invading force with prejudice. There is enemy blood, but mostly in the form of purple splashes. When humans get hit, blood also splatters. If it wasn't obvious, there is plenty of violence, especially weaponized (guns, cannons, etc.) as you blow the baddies to bits. The Wing Diver's uniform also reveals their midriff, and they have really tiny and tight shorts. Earth Defense Force 5 is an excellent sequel, and tons of fun, just like its predecessor. If you have a gaming PC, just get 4.1 for now (or wait for 5), as the price is great, and it's so much better than the console versions. If you are a console owner, then there is no reason not to get this game if you like crazy, over-the-top action - if it sounds like it will be fun to you, it probably will be. By showing this game to my friends and family, I personally have been the cause of at least a half-dozen sales for the PC version of EDF 4.1. These games really are that much fun. If the appropriateness issues don't unsettle you, then I highly recommend a good look at Earth Defense Force 5. The EDF deploys! While I can’t say I’ve ever seen a cheesy ‘50’s B-movie, I’m pretty sure I know what to expect after playing Earth Defense Force: Insect Armageddon. Ridiculous monsters, convoluted plot, over the top action—yes, I’m confident that the team over at Vicious Cycle Software watched just a few too many cheesy 1950’s movies during development. I’m also confident in saying that the end product of all those late-night monster movie marathons paid off. Imagine a game that combines third-person shooting with Starship Troopers (think humans vs. giant bugs), light RPG elements, and the craziest shoot ‘em up title you can think of. Earth Defense Force (EDF) is that game. Unfortunately, I doubt you’ve ever played it since it was never brought to the U.S., and the same goes for its sequel. However, the third installment finally saw a release in the form of Earth Defense Force 2017, and it was glorious. With its combination of split-screen co-op, dozens of weapons, and outlandish premise, the game was adored by critics and gamers alike. Not everyone loved it though, as its diverse ratings will show, but those able to get past its outdated graphics and somewhat repetitive nature found a satisfying experience. This latest installment hasn’t changed too much from its predecessor, but there are some noticeable improvements. The game’s objective is still to shoot thousands of giant alien bugs, robots, and everything in-between. Using tanks, bipedal mechs and an entire arsenal of weapons, you must rid the city of this alien infestation, even if there isn’t much of a city left afterwards. I mean, with all the rockets flying around, you’re bound to hit a building or two, and Vicious Cycle was kind enough to make the entire city destructible. Buildings, cars, random objects lying on the ground—everything can be destroyed, and it looks and feels awesome, especially when compared with the last title. The graphics have received a much needed upgrade, along with just about everything else. Three new character classes, survival mode, and online multiplayer make this a definite step above 2017. It’s unfortunate that there is significantly less content here (more on that later), but it’s so well polished that I still feel my money was well spent. Think of EDF as a B-movie. It’s ridiculous, cheesy, and a blast to play with friends, but with no plot to get in the way. And when I say ridiculous and cheesy, I really mean it. This game is a budget title, and it wears it like a badge of honor. The game cost $40 at the time of release, does NOT include an instruction manual or tutorial, and contains three different languages on its case. The voice acting (if you can call it that) sounds like something out of a Japanese monster movie; the graphics are stylized and without much detail, and objectives rarely deviate from “kill everything that moves”. For any other game, this would be an immediate turn-off, but Insect Armageddon embraces it wholeheartedly. Every mechanic and “flaw” here works to serve the game’s purpose: shooting legions of alien bugs and robots. All of the artistic elements (graphics, story, and sound), while somewhat lackluster, help to reinforce the gameplay in some way. The “simple” graphics prevent slowdown, and audio cues are used to alert you to an enemy’s attack. The story, which can be summed up by “you’re a soldier, so go kill stuff”, helps cement the B-movie feel. Unfortunately, just like a B-movie, it doesn’t last long. There are 15 campaign missions spread across 3 chapters in addition to 6 survival maps. The game encourages multiple playthroughs to level up the four classes on different difficulties, and a remixed campaign can be unlocked, but it’s still a quick game. Unless you have a good group of friends, I wouldn’t plan on spending more than 10 hours killing bugs and leveling the city. Don’t get me wrong, though; it’s amazing while it lasts. There’s nothing quite like destroying the city with a rocket launcher while flying around in your jet armor, or playing as any of the classes for that matter. There are three new classes (and four in all) in Insect Armageddon: battle (can use a shield and wield larger weapons), tactical (can deploy turrets, mines, radars and other equipment), the aforementioned jet, and the returning trooper armor (best all-around). As you progress through the campaign, each class levels up and gains new weapons and abilities. New weapons can also be found on the ground after defeating a high-ranked enemy. This is where the problems start. Now, each of the four classes has their own set of weapons, which none of the other classes can use. When the player picks a weapon up off the ground, there is no indication what class it’s for. It wouldn’t be a problem if it was always for the class currently being used, but it’s not. I had to go to the character selection screen and go through all the guns to find out what I had unlocked. But I can only rant for so long, because I’m overjoyed to say that not only does split-screen multiplayer return, but online play is also available. The entire campaign can be played cooperatively (two players), both online and offline. The survival mode can also be played in split-screen mode (two players), but the six player online is the real draw. Anyone can pick up and play Earth Defense Force. With its relatively simple controls, straightforward objectives, and great split-screen and online modes, EDF makes for a great game to play with friends. And since the campaign is rather meager, that’s probably where you’ll be spending the most time playing. The option to play with random people is present, but players without an internet connection should take note. It probably should go without saying, but not everyone is going to be able to enjoy this game. Not because of gameplay (though it’s possible), but because of entomophobia, otherwise known as insectophobia, or fear of insects. Ants, spiders, hornets, and ticks are encountered throughout the course of the game, and while I don’t believe they’re “scary”, not everyone will agree. Green or orange blood gushes out when bugs are shot. Cursing is frequent with b*****d, d**n, and h*ll used throughout. Unfortunately, the game’s photo gallery also includes seven hidden pictures of women in skimpy clothing. The pictures need to be unlocked via a secret code, but it’s an odd inclusion nonetheless. I cannot adequately describe how enjoyable this game is. Earth Defense Force: Insect Armageddon is a game in the purest sense of the word. No gimmicks or complexity; just you, a completely destructible city, and an army of bugs to slaughter. It’s not a long game, and there’s more objectionable content than I was expecting, but it’s a ton of fun and worth checking out—as long as you’re not squeamish.